It's that time of year again, when people start thinking about shopping for the holiday season. I'm famous for having all my shopping completed early, and this year is no exception to that. In the spirit of Christmas, I'm working with a number of companies who have joined in my Holiday Gift Guide 2015... and this is my fifth post! I was sent a t-shirt for review: their Instant Human Just Add Coffee, in the men's style. This item is available in woman's, kids, and hoodies style, and only comes in navy. Instantly when I saw this shirt at the top of their website, I knew I had to get it for my hubby. 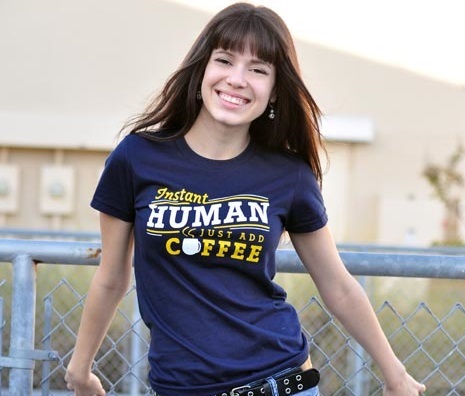 I could picture him wearing it around, as he's a real coffee addict! Interested in buying a shirt for someone as a gift, or for yourself? Sure you are... click here to grab yours today. Interested in checking out their Facebook and Twitter pages? Of course you do... you never know when you may come across a deal!